B.K.S. 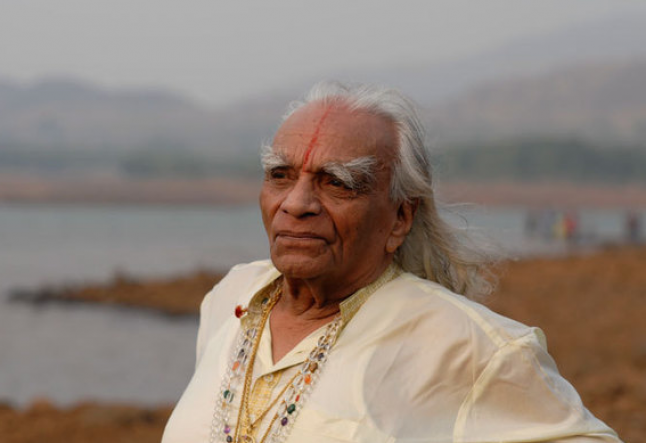 Iyengar died at the age of 95 on August 20, 2014. He said, “Yoga teaches us to cure what need not be endured and endure what cannot be cured.” He was a talented and legendary teacher of yoga who strongly believed in a dedicated practice. As a yoga teacher I personally did not have the opportunity to study with Iyengar but I have heard through many of my teachers that he possessed great integrity and incredible attention to detail. He was also known for his patience. Every Tuesday night I teach my “Yoga for Backs” class and more often than not I will incorporate a restorative bridge posture into the practice. It really is one of my favorite yoga poses and always has been. Many times I have experienced how towards the end of all these hot and sweaty vinyasa classes we feel like reaching for that yoga block to finally find some stillness and restoration. Iyengar yoga has influenced so many yoga teachers everywhere, regardless of our path of study. Most of us can take a look at our bookshelves and find a copy of “Light On Yoga” along with some of Iyengar’s other books. If we glance at the reading lists for numerous teacher-training programs across the globe we can surely find at least one of Iyengar’s books listed as a valuable source of information and guidance. His teachings have influenced so many of us on so many different levels. B.K.S. Iyengar developed a whole set of props such as blocks, blankets, straps and the use of chairs in order to facilitate one’s yoga practice. The use of props makes yoga accessible to the general population so that we all can experience the poses in a safe and supported manner. The asanas range from beginner to more advanced so that every body can appreciate the benefits of yoga. The Iyengar style of yoga is based on specific research of the body with a very strong emphasis on posture and alignment. Iyengar incorporated anatomy, physiology, and meditation in order to develop a well rounded and effective yoga practice. The asanas are held for a longer period of time than many other styles of yoga. These longer holds allow for the body to really experience the poses and feel the alignment. Through this mindful meditation and mental focus on the postures the practice creates a whole new level of attention and awareness. Through the longer holds in our yoga postures we can learn how to experience a calmer mental state and therefore allow energy to effectively channel throughout the entire body. Yoga practice has evolved through the years and as a society we have come to enjoy faster paced and more rigorous styles to match our fast-paced and hectic lives. Iyengar yoga teaches us to slow down and live in the present moment. Even if we only incorporate a few poses with longer holds and perhaps the use of props we can go deeper and experience the benefits that are so present in Iyengar’s teachings. When we calm the mind we become more aware of how we feel physically and mentally. When we take a step back we have more control over our reactions to life and certain situations. We better enable our coping mechanisms. Through the practice of pranayama we learn to emphasize slow and deep breathing, which allows for more patience and focus in each pose. When we learn to control the breath and find stillness we are better able to deal with the emotional and psychological stresses of our modern world. Iyengar’s teachings will live on as we continue to incorporate his methods and the use of props into our yoga practice. He truly was a great teacher and his influence will shine on through many of us who continue to teach and spread our passion for yoga.